Crispy and refined vegetable mix. 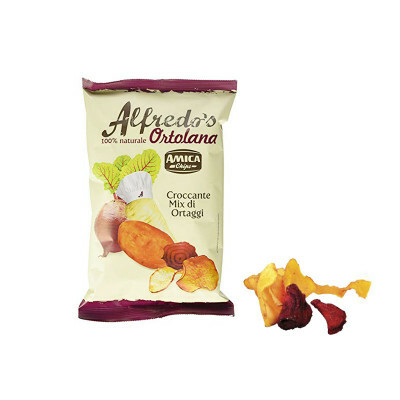 Amica Chips mix of three root vegetables ( parsnips, beetroot, sweet potatoes) are thin cut, fried and crispy to meet your expectation if you are looking for a rewarding alternative to standard crisps. A portion of Alfredo's Ortolana chips corresponds to 1 of the 5 a day. 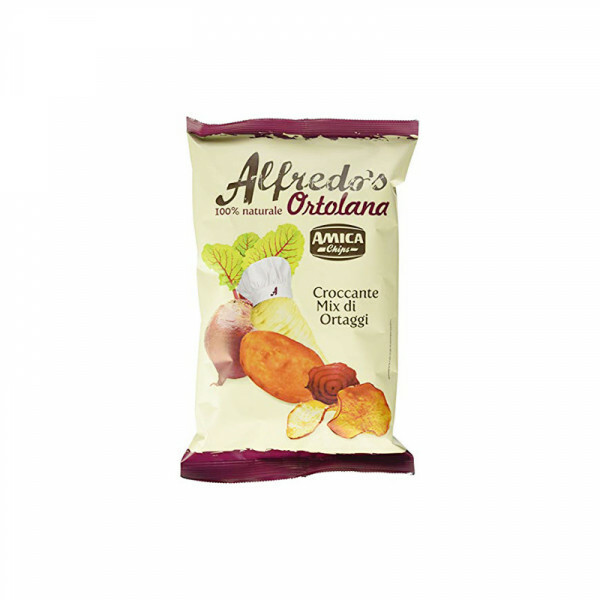 Ingredients: vegetables in variable proportion 62% (parsnips, sweet potatoes, beetroot), sunflower oil, sea salt. Store: in a cool, dry place away from sources of heat. vegetables in variable proportion 62% (parsnips, sweet potatoes, beetroot), sunflower oil, sea salt. Gluten-free and Vegan suitable. Keep in a cool, dry place away from sources of heat.